Carl Brenders Hand Signed and Numbered Limited Edition Canvas Giclee:"The Wanderers"
About the Artist: All of Carl's paintings derive from an extensive on site study of the fauna, flora and environment. He will personally take countless photos of the animal and its habitat, taking great care to document all the elements that will set the stage for his subject such as the vegetation at a particular time of year, the light, the relief of the landscape, the shape and color of the rocks� Only then will Carl let his imagination kick in, "the painting takes form in my mind and I make a few sketches." His vision finally materializes in a detailed pencil drawing which he then projects to his illustration board making adjustments to his composition before applying color. Although Carl has experimented twice with acrylic paint, he remains partial to the technique he has developed over the last thirty years. His paintings, typically created on illustration board, are executed in a mixed-media combination of watercolor and gouache. 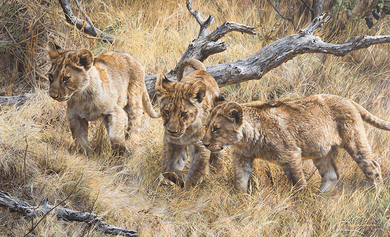 The powerful renditions of wildlife in all its spectrum, the mastery of details and the tactile realism Carl creates in his paintings irresistibly draw in the viewers, confronting them to a close encounter with an elusive and, sometimes, dangerous animal. Such vivid emotion caused by the artist's capture of nature explains the popularity of Carl Brenders with the public and his stature in the art world.